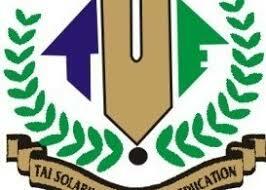 This is to inform all the candidates that participated in the Tai Solarin University of Education (TASUED) admission screening exercise that the management has released the 2018/2019 admission list. Go to TASUED admission statuschecking portal at https://my.tasued.edu.ng/login.php. Enter your Username (which is your JAMB Reg.) and Password (which is your surname) in the required columns.